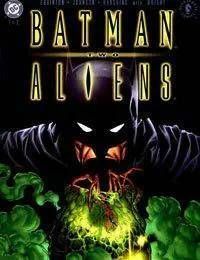 A Gotham City construction crew uncovers a sealed vault housing an unspeakable horror! Eighty years ago, an expedition to the South Pole uncovered a crashed spaceship, a spaceship containing the bloodthirsty Aliens. Now, after years in hibernation, a nearly desiccated Alien is unleashed upon the modern world. And its very, very hungry! Only one man has a chance of stopping this murderous beast... the Dark Knight Detective known as Batman!